As the heat continues to blister during this summer in New York, I think back to the first time I ever bought an air conditioner: fresh out of college. It was a daunting investment, but well worth the quality-of-life improvement. I stumbled through a few consumer report roundups online, asked the advice of friends and coworkers, and eventually found myself at a local hardware store, where the owner enlightened me to the complex world of BTUs, replaceable filters, and square footage calculations. Within 30 minutes I had a giant box on a dolly and 300 more points on my recently opened credit card. This seemingly banal transaction speaks volumes to the power of how established retail has pervaded our everyday experience in the United States. A lot had to take place for this all to happen: I had a problem but knew a solution existed; I had access to information on my options; I had a physical destination to see my options in person; a trained employee was available to provide advice and recommendations; and I had a means of financing to bring this appliance into my life almost immediately. The thing is, for millions of people, this model doesn’t exist — and those people are my customers. I am the cofounder and CEO of BioLite. We design and manufacture personal-scale energy appliances that enable our users to cook, charge, and light their lives off the grid. We serve two markets that are very different but united by the common need for reliable, safe access to energy: outdoor recreationalists and low-income households in emerging markets. Our flagship products are wood-burning stoves that generate electricity from fire while reducing toxic smoke emissions by 90%. The stove designed for campers is called the CampStove, and the stove for families living in energy poverty is called the HomeStove. For our outdoor recreationalists, the model has been created for us, and we enjoy the benefits of a well-established retail structure: We sell both online and in established, well-known retail stores, where knowledgeable staff can explain our products to new customers. Customers have myriad channels to discover new products and shop at outdoor gear retailers to explore, evaluate, and choose what they need. Store displays, user reviews, and expert employees with firsthand experience all play a role in building the confidence that is critical to a purchase. The majority of our customers across India and sub-Saharan Africa live outside city centers, in areas that large-scale retail stores just don’t reach. Moreover, these customers don’t even know our cookstove exists, so before we even get to delivery, we have to figure out how to help people discover our product. These challenges forced BioLite to reevaluate our approach and customize our sales methods to a market that demands an entirely different way of doing business. Much like our team of engineers who are constantly testing for the best functionality of our products, our team for emerging markets set up a series of experiments to explore which distribution model functioned best in these remote environments. In short, how do you sell something where large-scale retail channels don’t exist? Our target customers in India don’t have access to large retail shops, but they go to handi shops, small storefronts that sell cooking supplies. These storefronts have long-established customer bases that visit with the intent of purchasing products like pots and pans. Given that we’re in the business of clean cooking, we hypothesized that we’d be successful by selling our stoves through these shops. It was a good idea in theory, but ultimately it was too passive as a sales approach: Simply placing our HomeStove on a shelf did not lead to uptake. Handi shop customers had never seen a product like ours. They didn’t know what it was, how it worked, or why it could have a profound effect on their daily cooking. The revolutionary benefit of co-electricity was on the package, sure, but who was taking the time to read through the box, unprompted? Most important, seeing is believing: Even if they were heading out to buy a high-tech appliance, they need to see it in action before they make a decision to purchase. With no one in the store to demonstrate the HomeStove in real time, it’s pretty hard to understand and trust that a fire can be smokeless, cook your chapatti quickly, and power your cellphone. From this failed experiment, we learned that a clean cookstove like our HomeStove is a push product; we can’t just place it on a shelf and expect customers to buy in on their own. We would need to proactively get in front of them and bring the stove to life. The question for us then became, how could we build a sales experience where fire was inherently part of it? After the lessons of the handi shop experiment, we identified our next experiment over a cup of tea. Chaiwalas, or tea sellers, sit on almost every corner in India, brewing up chai for constant crowds of passersby. Chaiwalas already cook over fires to make their tea, so using the HomeStove as an alternative could immediately demonstrate the benefits of our product to a captive audience — a bit of a drink and a show, if you will. A chaiwala in Orissa, India, brews tea on a BioLite HomeStove. Photograph courtesy of BioLite. 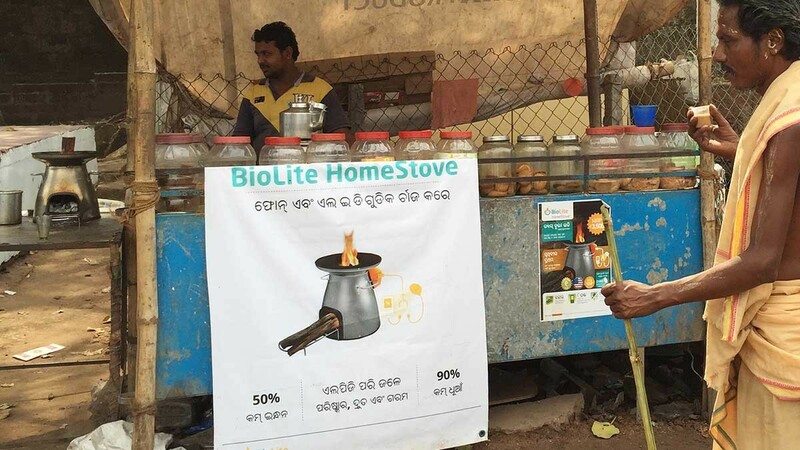 We equipped a dozen chaiwalas with HomeStoves, trained them to use the stove, printed BioLite banners to hang on their stands, and set them up with cords, so customers could charge their phones off our stove. As a crowd-pleaser, the promotion was a success, drumming up customer excitement; as a sales conversion, it fell short. Here’s the thing. These men are chaiwalas, not stovewalas. They’re in the business of selling as much chai as they can, not presenting in-depth demonstrations of an aspirational, modern cookstove. They were interested in getting through as many cups of chai as fast as possible, not demonstrating the stove’s feature set. Moreover, while hundreds of people buy chai every day from these stands, the customers are there to make a two-rupee purchase; they’re not in the right mindset to be considering a high-ticket item like our stove. They want to get their chai and move on, not hang around and charge their phones. From this, we learned that our products require a highly trained representative who can speak to the benefits of our stove in front of customers who are willing to purchase it. Now we knew that selling the stove required a sales environment where it could be used — but also trained salespeople who could teach people about it. Imagine an Apple Store…in the middle of Bhubaneswar, India. That’s what we set out to create. We wanted to create an immersive experience wherein we could introduce potential customers to our vision of energy everywhere, a place where highly trained and enthusiastic staff could entertain, educate, and entice visitors to the unique benefits of the HomeStove. We would have complete control of the customer experience, and our HomeStove would always be the star of the show. We found an ideal storefront near a busy market in central Bhubaneswar. Our local team worked around the clock, doing custom build-outs while juggling Skype calls with the design team back in New York. Chai stands were built, graphics were printed, and the team was ready for launch. Launch day was a wild success. The store filled with customers, local papers heralded our arrival, and sales spiked. We created buzz with those same cups of chai, but this time the cooking demonstration was conducted by a member of our staff, who then invited prospective customers into our shop. Unfortunately, as the weeks passed we found that maintaining a steady stream of customers proved to be a major challenge. Many of our target wood-burning customers lived on the outskirts of town and had no reason to travel to the central market, where our store was located. This taught us that as an unfamiliar brand with a fixed retail shop, it’s really hard to acquire customers, especially if people have to go out of their way to find you. While we made some sales through this channel, we realized we needed to bring our retail store experience directly to a network of customers who were ready to purchase. We needed locally embedded partners. What if we teamed up with a distributor that already had the trust of, and relationships with, potential customers? At this point we’d experimented enough to know there were a few critical factors to activate a meaningful flow of sales: a highly specialized local sales team who could demo the stove, and a targeted network of potential customers that our sales team could engage at peak interest. This led us to experiment with a sales method inspired by an unlikely giant back in the United States: Avon. Greenlight Planet in India has a proven track record of distributing energy products in remote districts by utilizing local sales representatives. These “reps” host demonstrations and attract community members through their local connections and trusted recommendations. Instead of selling makeup or Tupperware, they sell solar lights — millions of them. Through an Avon-like model, they empower a network of salespeople to engage their neighbors, family, and friends. 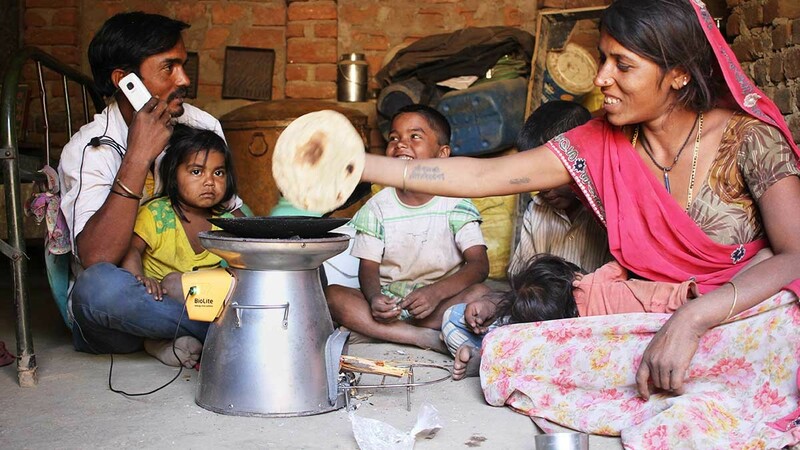 In 2014 we partnered with Greenlight Planet to take a spin at door-to-door stove selling. Greenlight Planet’s model had real promise but required deep knowledge and enthusiasm; asking a solar expert to suddenly expand their repertoire to ultra-clean, electricity-generating wood stoves was a tall order. Where a solar light can simply be turned on to show its value, a stove demo requires 30 minutes of time and extensive training about the technology. In addition, stoves are difficult to transport from demo to demo. We needed to customize this model for cookstoves, and ensure that the salespeople were set up for success, most notably by letting them be dedicated full-time to only selling stoves. With valuable learnings from the solar salesmen, we began the search to build our own dedicated team of salespeople to help us “open up shop” across each region of operation. One by one we found our teammates, a group of high-energy, reliable agents who had the potential to grab an audience’s attention through captivating demonstrations and impressive reserves of facts and anecdotes. We call them the BioLite Burners. Each Burner undergoes a five-day intensive training and receives their own HomeStove Delivery Box. Inspired by Domino’s motorbike deliverymen in Mumbai, with boxes that can maintain the heat of the pizza, our boxes attach to Burners’ motorbikes, making it easy to transport stoves to demonstrations or home deliveries. Local experts, attentive networks, and an easy way to transport stoves — what more do you need? You need a crowd that is prepared to spend money on a product in real time, and has access to the most fundamental thing involved in purchase: cash. If our customers are liquidity constrained and risk averse to purchasing a pricey item, was there a model to solve for that? In emerging markets, microfinance has been a key economic engine in helping low-income households fund businesses and other important purchases in daily life. Customers show up regularly to take out loans, arrange payments, and track their finances. What better place to discuss a valuable investment for your home, than at the epicenter of where investments are made possible? Through partnerships with microfinance institutions (MFIs), not only are our Burners able to easily travel to MFI branches or villages to demonstrate the stove with real-time burn demos, but also we can set up interested customers with finance programs on the spot, to make purchasing these stoves immediately achievable (all the more so because the majority of our customers recoup the cost of the HomeStove in six to eight months, via fuel and electricity savings). Equipped with their motorbikes, our Burners deliver stoves or provide after-sale service to our customers when necessary. Through these partnerships we have been able to recreate the product discovery experience that’s traditionally found in retail environments in Western markets. We found our missing link. Where each of the models before taught us the importance of various components of our sales model — customer acquisition, demonstrations accompanied by a strong pitch, and co-location of our product and network — financing made it easy for people to become customers. I think back to when we initially placed our stoves on shelves in the handi shop, and I see that as an inflection point for BioLite. Our sales model had a gaping hole, but rather than scratching our heads and trying the same thing again, we rebuilt the model to make it more resilient and aware of the unique local challenges our markets face. Those years of experimentation with different sales models were a springboard to the tens of thousands of households we have reached this year thanks to our Burners. We have built a framework that achieves the unique duality of being highly localized while promising rapid scalability across all of the emerging markets in which we work.